Do you have questions or need a helping hand? Which payment provider can I use? Choose the payment provider of your choice and click on "buy now". You will be redirected to the SSL secure payment page of the selected payment provider where you will make the actual payment. Your bank information, credit card number or your PayPal/Amazon account are not stored with Gamesplanet! You can comfortably shop with us using your PayPal account. The payment process takes place on the SSL-secure pages of PayPal. Why is it useful to verify my PayPal Account? How can I change my primary email address at PayPal? 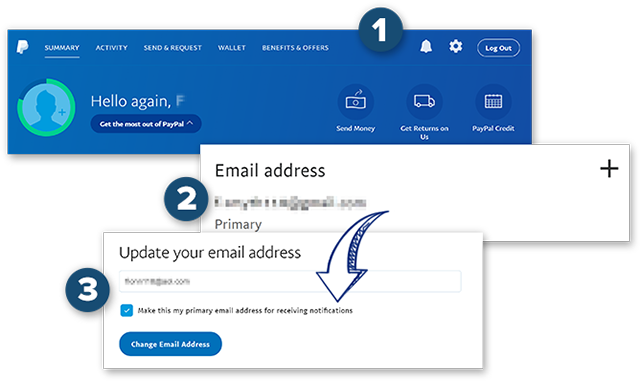 Follow those easy steps to change the primary email address of your PayPal account. This will ensure you'll never miss important updates from PayPal nor messages from merchants. Please be aware that PayPal shares this email address with all merchants as the prefered way to contact you. Click the settings icon near the top of the page (It looks like a gear). Click Change email address underneath and you're all done. It's fast and easy to make a payment with your credit card. The payment will be processed on the SSL-secure payment page. You may use your Visa, MasterCard or American Express credit card to have your payment processed. Pay for your games with your Amazon account - only a few clicks and you're done! You can use your Amazon account to log in and pay, no more searching for credit cards or bank details. Your payment details are securely stored with Amazon, not us! You have a fully packed Bitcoin-Wallet and you're a passionate gamer? You can now spend your Bitcoins on Gamesplanet, easy, secure and fast! We process Bitcoin payments through our partner BitPay. Currency exchanges are done on the fly during checkout - easy and transparent! From now on you can use paysafecard at Gamesplanet. Fast, easy and secure - just as if you were paying with cash. And best of all, Gamesplanet does not charge you any extra fees if you use paysafecard! Find your nearest paysafecard sales point or use your paysafecards already purchased at Gamesplanet. More information about paysafecard NEW: Transfer paysafecard credit. You have remaining credit? You want to combine several PINs? The money should go to Gamesplanet? Nothing easier than that, top up your Gamesplanet Wallet now! The Skrill payment method allows you to buy your PC games on Gamesplanet.com either with the Skrill wallet or with Rapid Transfer which allows you to make a bank transfer. If you want to use different payment methods like Giropay or iDeal to pay with Skrill, it's possible! Just click on the "+" button on the payment page and select the country where this payment method is available (e.g. The Netherlands for iDeal).